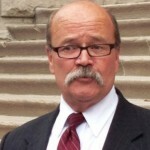 Democrat John Gregg is running for governor against Mike Pence. John Gregg is the Democrat who ran unsuccessfully to replace Mitch Daniels as governor of Indiana. He was defeated by Republican Congressman Mike Pence. Gregg represented the state’s 45th District from 1987 to 2003, including six years as Speaker of the Indiana House. His running mate was Vi Simpson. Listen to StateImpact‘s complete interview with Gregg — we’ve posted it along with a transcript here. Gregg called for increased access to early education for middle-income families. (Indiana is one of 11 states that doesn’t have dedicated funding for a pre-kindergarten program.) He proposed a pilot program for 4-year-olds based on what schools are doing in Wisconsin. Gregg also supported raising the high school graduation rate and making college more affordable need to be goals in Indiana. But he also called on schools to prepare kids who don’t plan to go to college to enter the workforce with more vocational education programs. State superintendent Glenda Ritz and Democratic gubernatorial candidate John Gregg outline their universal pre-k proposal. What Does Ritz’s Campaign Move Mean For The 2016 Election? State Superintendent Glenda Ritz announced Friday she will not seek the Democratic nomination for governor, focusing instead on a campaign for reelection. Where Do Gubernatorial Candidates Stand on Education Issues? Education has been a big issue in Indiana, and the trend will no doubt continue well into the 2016 race for governor. Republican Mike Pence easily defeated Democrat John Gregg and Libertarian Rupert Boneham Tuesday in a race run primarily on jobs and the economy. Election Results: Democrat Glenda Ritz will be Indiana’s next superintendent of public instruction after defeating GOP incumbent Tony Bennett. We have information on how to vote and the candidates you’ll choose between. In a state where unemployment remains above 8 percent, Mike Pence and John Gregg have pinned their education platforms on career readiness. Both candidates say something must be done to get more Indiana children into early childhood education programs. But is it the state’s role to provide such programs? GOP candidate Mike Pence highlighted his plans to expand career and technical education in high school while Democrat John Gregg says it’s time for Indiana to take the first steps in creating a state-run preschool program.